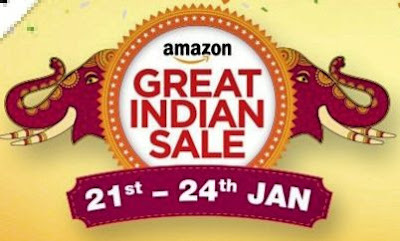 The Amazon Great Indian sale starts midnight today which is January 21 and it will continue till January 24. During Amazon Great Indian sale, Amazon offers huge discount on mobiles and accessories which is 40 percent ,on electronics 55 percent and on home and kitchen appliances 50 percent.The good news is for the all Amazon Prime members because they will get very early access to all this amazing offers on January 20 at 12 Noon(midnight) , it means 12 hours before the normal users of Amazon. Sale contains products categories like mobiles and accessories , electronics , laptops , home and kitchen appliances , book , daily essentials , fashion products , and many more products will be available at a discounted price. During Amazon Great Indian sale OnePlus 5T Lava Red Edition dur will be priced at Rs 37,999. The Honor View 10 is the company’s latest flagship, and main thing of the device is the Kirin 970 chipset , which is having Neural Processing Unit (NPU) for AI related tasks. This smartphone was priced at 29,999 earlier this month from it’s launch. also noted that LG V30+ is a high-end premium smartphone that comes with a 6-inch OLED display and Hi-Fi Quad DAC built-in, with sound tuning by B&O Play. The e-commerce website has just given a small idea about the offers but the actual prices of all the product’s will be revealed only when the sale is going live.The list of Smartphones that get huge discounts which are Honor 6X, Samsung On5 Pro, Moto G5s Plus, BlackBerry KEYone, LG Q6, Google Pixel XL, and many more. PREVIOUS POST Previous post: New Maruti Suzuki Swift Will launch at Auto Expo 2018 Bookings Open.